SCI-FI MONTH - Lets make it so!! Hey! So it November and that means two things, the first is it is my birthday this month and secondly IT IS SCI FI MONTH!!!! So I have plans for catching up on my NetGalley sci-fi reads and these babies below will be taking me to those strange worlds that only sci-fi can take you to! I plan on posting some other random bits and bobs such as why I love this genre so much as the month progresses and I look forward to reading your awesome posts and hopefully finding some new reads too! Have fun if you are taking part, if you want to take part, check out Rinn Reads who is hosting, here! Ha ha great post! Your books all look good and I'm looking forward to all the posts this month, should be pretty awesome! I've seen a few intro posts pop up today and it's nice to see it getting underway. Enjoy your week! Thanks Greg! Looking forward to seeing what you have up your sleeve! I love sci-fi, total escapism for me! 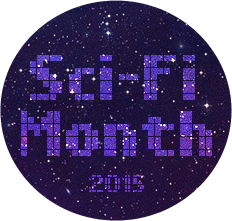 Yay, thanks for joining in with Sci-Fi Month :D What a great selection, I'm also reading Golden Son this month. It is taking a little getting in to but so far so good! 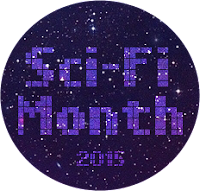 Looking forward to see what you have planned for sci-fi month. I had a lot of fun participating in this challenge last year. I hope to read the sci-fi book Nexis that I got from netgalley last week, but not sure if I will read any sci-fi books this month, we'll see. Your list of sci-fi books you hope to read looks good! Thanks Lola, I'm hoping I can get them all read in the month! I saw Nexis but trying not to download anymore!! Ah I wish I had known about Sci-Fi month. I have so many sci fi reads waiting to be read! I have loads, I just love reading them but I am sure next month I will have a non sci-fi month! Gotta love that sci-fi! I hope these are all wonderful reads and posts in the future for us! What a great introduction. I'm a Star Trek fan, myself, so this made me happy. Gotta love Star Trek especially Jean-Luc! !